PowerPoint and other apps are getting a nice refresh in Office 2013, but Microsoft wants you to pay $100 a year for them. Microsoft is about to shake up Office, its most sacred cash cow. 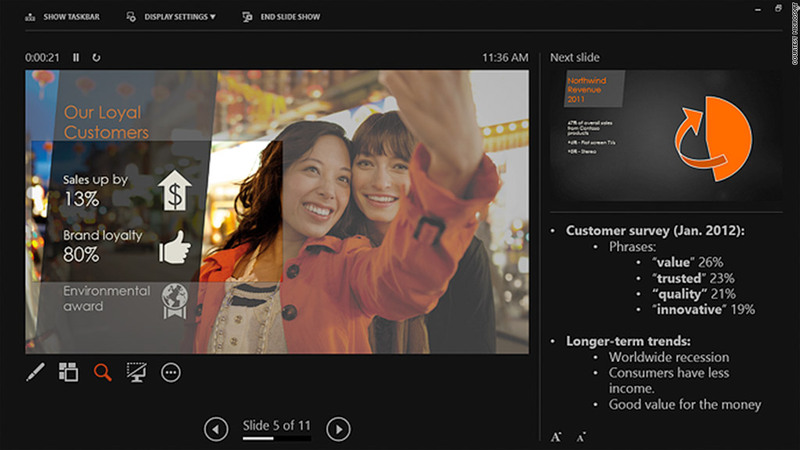 Starting on Tuesday, Microsoft (MSFT) will be offering Office as a subscription service for consumers. For $100 a year, "Office 365 Home Premium" customers can put Office on up to five computers (including Apple (AAPL) Macintoshes and Windows 8 tablets) and store up to 27 gigabytes of data on Microsoft's SkyDrive cloud storage service. The subscription includes frequent software updates and allows users to automatically load their customized Microsoft Office settings on each different device. Office 365 users will also be able to get "Office on Demand," a feature that allows them to temporarily access the latest version of Office on any computer through a Web browser -- whether or not that device has the program installed. One caveat: Once you stop paying, you lose the software. Is all of that worth $100 a year? Possibly. The bigger question is whether changing the Office business model is worth it for Microsoft. Office has 1 billion users around the world, and last year it brought in a profit of nearly $16 billion on sales of $24 billion. Both sales and profit grew 7% even though the latest version of Office was already two years old. Microsoft will still sell Office the traditional way too, but for the first time since 2001, the price tag is going up. Office 2013, which hits store shelves on Tuesday, is priced at $140 for the basic version, a $20 increase over Microsoft Office 2010. The new software costs $220 if you want Outlook and $400 if you want Access and Publisher. Unlike Office 365, the Office 2013 software won't receive regular updates. Microsoft said it is targeting Office 365 at families with multiple computers, including laptops and tablets. "The lines between work and home are blurring," said company spokesman Jevon Fark. "People want a seamless experience across all their devices." There's another emerging trend -- one Microsoft doesn't like to talk about -- threatening Office: PC sales are slumping badly. People aren't replacing older PCs, and they're relying on tablets (let's be honest: iPads) for their daily computing needs. Office, which is not yet available on the iPad, is getting replaced by free alternatives like Google (GOOG) Drive. That means a growing number of Office customers are staying with the same version for five, six or even seven years, according to Laura DiDio, principal analyst of consultancy ITIC. That doesn't put money in Microsoft's pocket. "They have to continue to drive annual revenue, and that means changing with the times," DiDio said. "It's no secret that Microsoft is under attack from Google." Microsoft's hope is that subscription pricing will create a predictable, fixed sales stream it can count on every year. If, that is, people pay up. Will you?